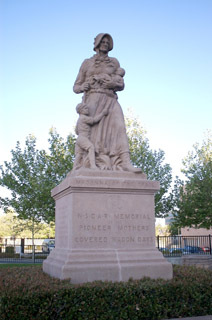 One of the earliest public memorial sculptures in New Mexico, Madonna of the Trail, in Albuquerque has been a local landmark since 1928 when the mayor led a parade from a downtown hotel to the public plaza. Bands played patriotic songs at the unveiling of the robust pioneer mother before a crowd of 500 local citizens. Cast in a pinkish mixture of crushed marble, Missouri granite, stone, cement, and lead ore, the stern-faced five-ton Madonna commemorates the contributions made by women on the road west. The 18-foot Amazon had sisters. The National Society of Daughters of the American Revolution (DAR) erected 12 identical statues across the country during late 1920s. The idea for the statues began in 1909, when a group of women formed a committee to advocate the locating and marking of the Old Santa Fe Trail in Missouri. The effort quickly sparked successive groups tied to the DAR and dedicated to establishing an Old Trails Road--a modern highway that both connected the country’s coasts and memorialized United States exploration and settlement. The DAR discussed various ways of marking the route and ultimately decided to construct the 12 large markers titled “The Madonna of the Trail.” Between 1928 and 1929, the DAR placed Madonnas in Springfield, Ohio; Wheeling, West Virginia; Council Grove, Kansas; Lexington, Missouri; Lamar, Colorado; Albuquerque, New Mexico; Springerville, Arizona; Vandalia, Illinois; Richmond, Indiana; Beallsville, Pennsylvania; Upland, California; and Bethesda, Maryland--one in every State through which the National Old Trails Road passed. The one on the central square in Albuquerque was number six. Santa Fe, however, almost got the statue. The reason Albuquerque got the statue in the end is because the monument did not blend well with the Spanish-style art and architecture of Santa Fe. And, more to the point, the Albuquerque DAR chapter came up with funds to ship the monument before the Santa Fe chapter did. Not everyone in Albuquerque was pleased with the new piece of public art. At least one citizen, Mary Austin, voiced her negative opinion in the press. She wrote, “not only is the statue indifferent art, but as a descendant of a long line of Pioneer Mothers myself . . . I regard the proposed monument a caricature.” To be fair, the melodramatic design was reflective of the patriotic zeal of its era. Sculptor August Leimbach was straightforward in expressing his admiration for his no-nonsense female paragon of frontier strength wearing remarkably durable boots. According to Leimbach, the idea he had in mind was that this strapping woman was waiting for her husband at a block house in the West. The father had not arrived home as promised. Baby in one arm, gun in the other, and an extra child clinging to her skirts, the granite Madonna strides out to search the horizon. Aesthetic objections aside, Albuquerque welcomed the monument with open arms. It was placed in the city’s McClellan Park facing Route 66, the main highway through the city. The statue looked out on Route 66 until 1937 when a new alignment moved the highway south to Central Avenue. In 1996, the sculpture was in need of cleaning and repair. Restoration work included removal of the soot and dirt and repair of holes and gouges with mortar. Following its restoration, the statue was relocated approximately 100 feet north of its old location, due to the construction of a new Federal courthouse on the block. The monument was rededicated at its new site on September 27, 1998. Although moved a short distance, the monument continues to be oriented toward the 1926-1937 era roadbed of Route 66 through the city. The Albuquerque monument retains its integrity of setting, design, and feeling. The only other Madonna that has retained its integrity is the one in Upland, California. The Albuquerque Madonna of the Trail was listed in the National Register of Historic Places in 2006. The Albuquerque statue remains a local landmark, a physical remnant of 1920s ideas about the connection between trans-Atlantic automobile travel and western settlement, and a tribute to the women who helped move the country westward along its earliest roadbeds. The New Mexico Madonna of the Trail is located at the intersection of Marble Ave. and Fourth St. in a small park on the grounds of the Federal Courthouse in Albuquerque, NM.